Enthusiastic traders from several counties in northern Kenya and from across the border in Ethiopia joined a livestock trade facilitation forum in Marsabit, Kenya on 9 May 2018. By close of business, participating livestock buyers and sellers signed contracts for a total of 5,373 livestock at a value of USD 406,774. 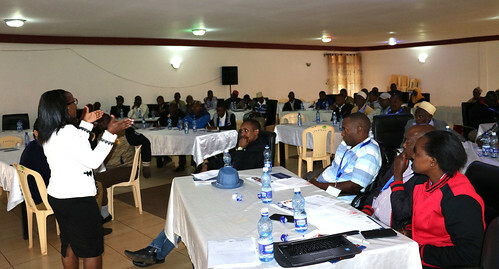 The United States Agency for International Development (USAID) Hub, in partnership with the Accelerated Value Chain Development – Livestock Component (AVCD-LC) program (implemented by the International Livestock Research Institute), organized the livestock trading platform as a means to efficiently draw traders together from the arid and semi-arid lands (ASALs) regions and make market linkages. It was a resounding success. ‘I am so happy that for the first time Ethiopian traders are able to sit down with Kenyan traders to speak the same language: trade,’ said an Ethiopian trader. ‘Traceability is my number one gain from the forum. I am now able to identify the origin of my products. I have also gained direct trade linkages to suppliers enabling me to cut my business costs significantly. I’m now able to buy 50 goats per day seamlessly to run my business!’ said Peter Mbugua, a businessman from Thika, Kenya. In Kenya over 70% of the national livestock herd, including camels and donkeys, is kept in arid and semi arid lands (ASALs). The livestock sector employs about 90% of the 7 million people in ASALs and contributes to 95% of the family income. It contributes to 42% of Kenya’s agricultural gross domestic product (GDP) and 10-15% of its total GDP. With such a great impact on the economy, the livestock sector has a high potential to contribute towards achieving economic growth through an expansion of the regional and export market of both semi-processed and finished leather goods. Over 50% of Africa’s livestock is located in the East Africa region. The region is home to approximately 107.2 million herd of cattle, 178.8 million herd of small ruminants, 11.3 million herd of camels and 4.4 million herd of pigs. The livestock sector is one of the key agricultural sub-sectors accounting for approximately 40% of the agricultural GDP in Ethiopia and Kenya and nearly 20% in Uganda. Rural households are dependent on this sector with about 60-80% keeping livestock to supplement their food needs as well as their household income. Through USAID support, the Hub and ILRI’s AVCD-LC program will host subsequent livestock trade-facilitation fora in Wajir, Garissa, Isiolo and Turkana to support efficient market information dissemination and business linkages aimed at increasing livestock trade and resilience of communities living in the ASAL regions. Reblogged from the East Africa Trade and Investment Hub (EATIH). Tags: ASALs, AVCD, USAID. Bookmark the permalink. Kudos for the good work.